"I owned and drove an ex-Ford factory sponsored B Sedan Lotus Cortina from 1968 through 1971. It was acquired for $1300 cash and a trade-in D Sedan Ford Anglia that I had built and raced in SCCA SW Div 1966 thru 1968. 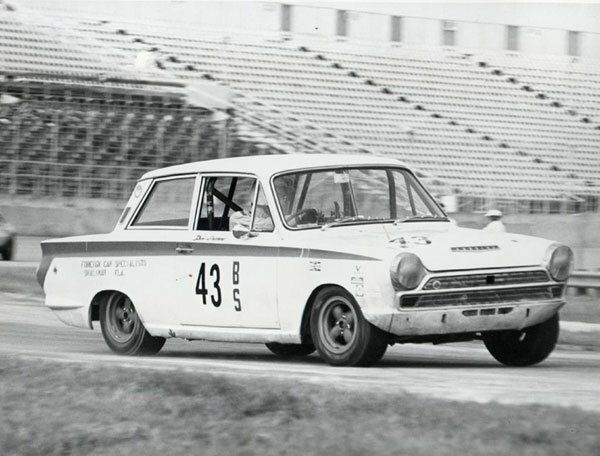 The Lotus Cortina had previously been owned and raced by Charley Barns of Dallas, Texas. The engine was extensively modified by BRM (Phase IV), with wild cams, high compression pistons, steel crank, 1 inch wrist pins, light rods, and 2x45DCOEs." Above, at the ARRC practice session at Daytona, November, 1969. 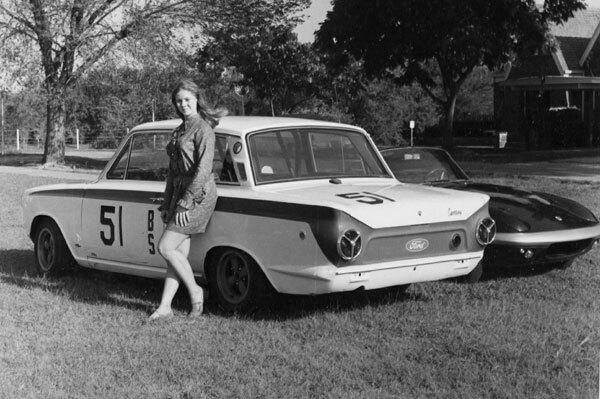 "The beautiful young lady posing with her Elan and my Lotus Cortina was my girlfriend at the time, a lovely Oklahoma City girl named Jan Harris. She was the perfect girlfriend for a young racer (I grew up in Oklahoma City), and loved sports cars herself. She went with me to many SCCA races in the Oklahoma and Texas area from 1966 thru 1968, and more than once autocrossed a friend's GT-350. Unfortunately, although we were engaged once, we never married, and in about 1986 she died of brain cancer." "I was doing quite well at an IMSA Under-2-Liter sedan race, at a 1/2 mile banked oval track in Montgomery, Alabama, until the left rear wheel bearing pulled out, resulting in loss of tire/wheel/brake drum/axle from the inside rear (we were turning left all day, you see). Since my Lotus Cortina had a limited-slip differential, it kept putting power to the other wheel, and with the left turning and the banked turns, I didn't know immediately that I was driving a tricycle. My friends took slides of me passing between two 1.3 liter Mini-Coopers, as the wheel/axle bounced high into the air. I could kick myself for losing track of those slides, but I'll find them someday, and send copies to you." 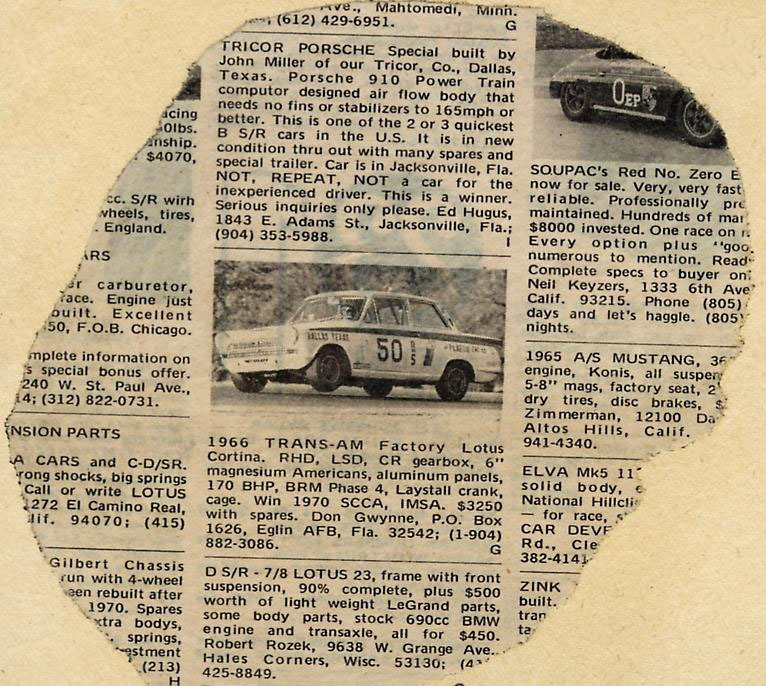 "While racing the Lotus Cortina at another IMSA Under-2-Liter sedan race at Talladega, Alabama, I placed fourth of a 22 car field notwithstanding total loss of brakes and a shattered windshield. One of the cars I was lapping went off course into the infield. The driver of that car, a relatively stock pushrod Cortina sedan, was Bill France, who owned the place." 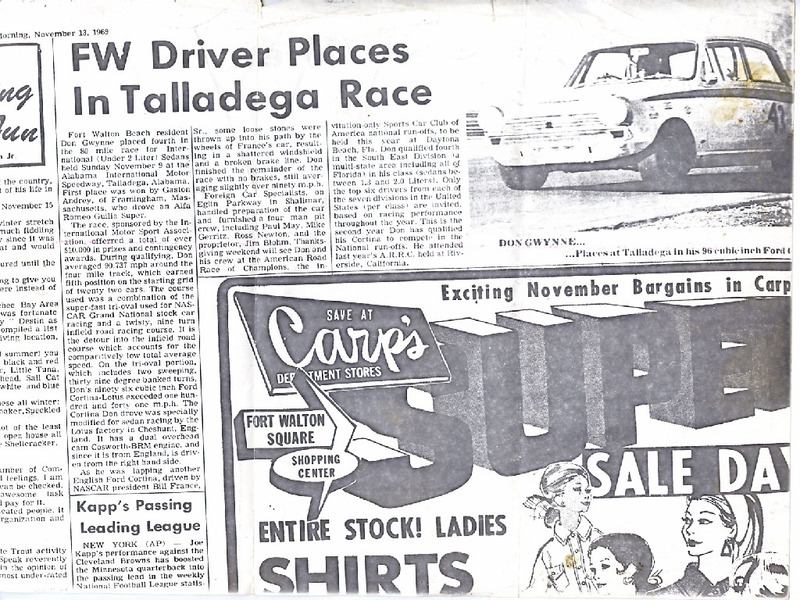 "The newspaper article (pictured above) of that 1969 Talladega race event got me an invitation to co-drive a Z-28 Camaro which Preston Hood Chevrolet (Fort Walton Beach, Florida) had been running in Trans-Am races. They wanted to run the 24-Hour Daytona FIA enduro and the 12-Hour Sebring FIA Enduro in 1970 & 1971, and needed a sedan-racer co-driver. They didn't have to twist my arm very much at all." In 1971, my company transferred me to England. The ad listing above ran in Competition Press & AutoWeek magazine, now-a-days just called "AutoWeek". Who wouldn't want that car now for a price of $3,250! Hard to believe there were no takers back then. So I sold the Lotus Cortina engine to a Formula B racer from Las Vegas, Nevada, and then sold the rolling chassis to Robert Winkelmann racing in California. Now seeing what is happening in vintage racing, I've kicked myself a hundred times for selling that Lotus Cortina back in 1971. Arrrrggggghhhh!!!!!" "I'd love to find out what happened to it and to its sister cars." Don has scanned some of the old photographs from his scrapbook, and these historic pictures and accompanying text are now available here. Take a Look!